Morning ladies it's been a while since I did a round up of my latest purchases, mainly because a lot of the things I've been buying have been preloved pieces but there are a few other picks that have made it into my wardrobe that I thought you might be interested to see. 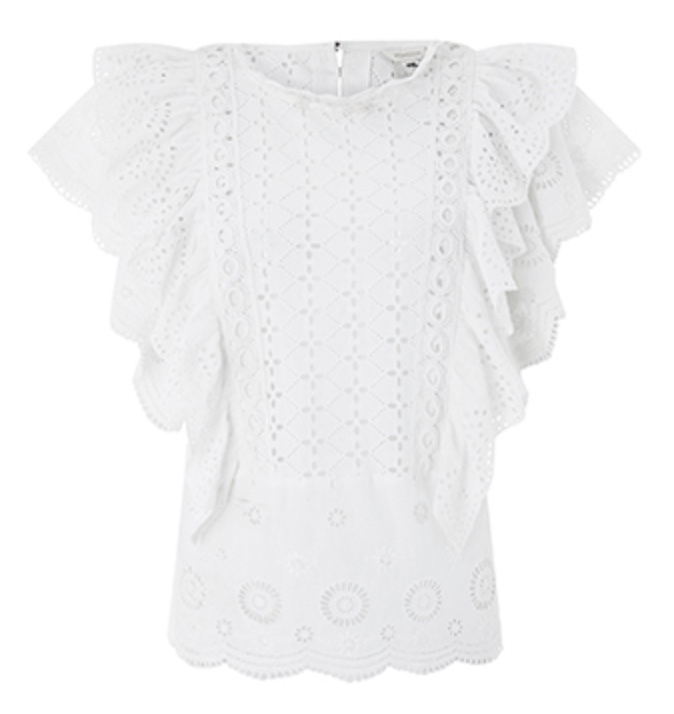 Starting with this lovely openwork broderie top that's idea for teaming with jeans now summer has arrived. In fact it got it's first outing for quiz night last night (see here) & if I hadn't purchased a few new white tops I'd be very tempted by the white version too! Personally whilst I'll wear my summer dresses & maxi skirts I find that jeans/cropped trousers are still my general daily 'go to' so a few new tops/pretty blouses makes the perfect addition to my wardrobe, especially if they're tops that can be dressed up or down. Which is why it's mainly been tops that have found new homes in my wardrobe these past few weeks. As you can see there's a bit of a theme going on but for me a pretty top, cropped jeans & a statement pair of sandals just works & I know I'll get my use out of them. The above top is even prettier in real life & when on. 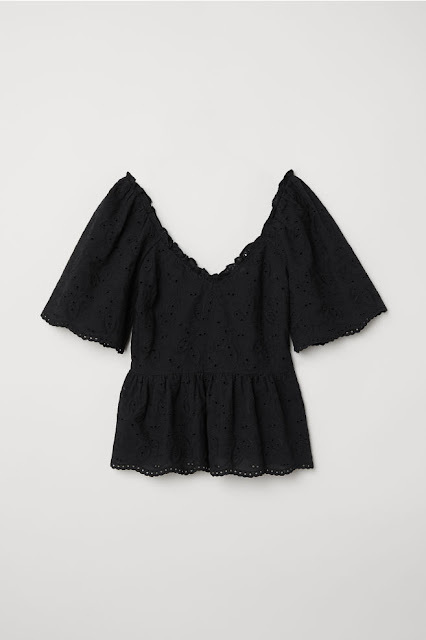 Plus I was looking for a black broderie top that could be worn with a preloved maxi skirt I've bought & ideally wanted one that didn't need tucking in so this is perfect & also comes in yellow & white. Although be warned it's quite a small fit so you may want to think about going up a size. Talking of white tops I just couldn't resist this beauty that I shared over on Stories & got a resounding yes. Then I've also treated myself to this timeless pale blue shirt, which is made from a gorgeous soft cotton & a great weight so falls perfectly. Ideal for pairing with white in the summer & then layering under a cashmere knit come Autumn. 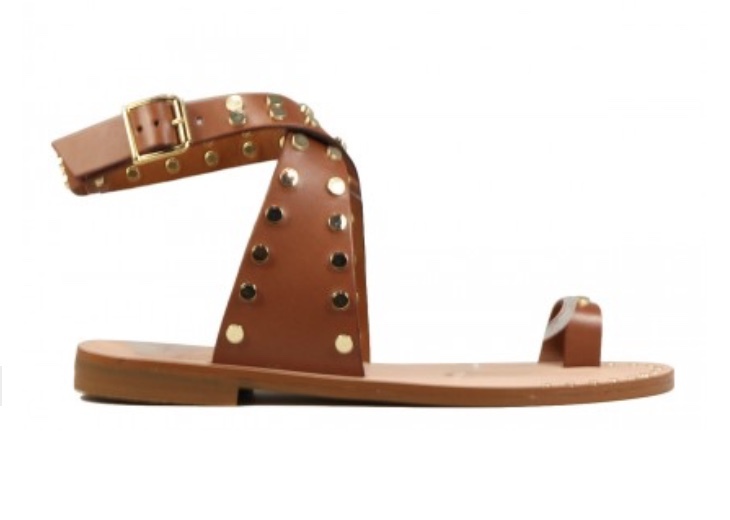 In terms of sizing I'd say they're true to size & I went with a size 36 in this & the below top. Now you might recall me saying I was looking to introduce a little more green to my wardrobe & this top with it's gorgeous gold thread makes the perfect addition. Something a little less tailored in style to my normal tops means it's perfect for layering with some fine gold jewellery for a more boho feel as well as layering with a lace cami or simple tank tee. 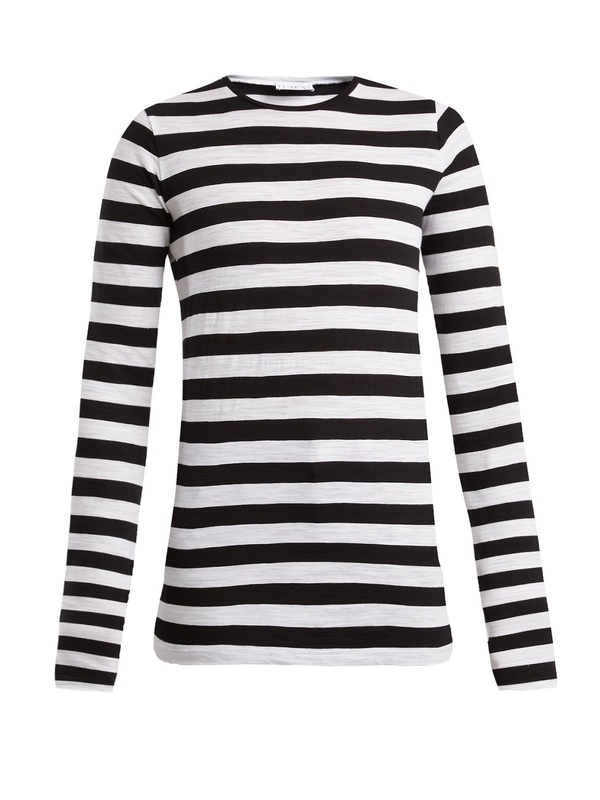 We all know you can never have enough stripes in your wardrobe & I just love the thicker monochrome stripes of this long sleeved tee. I call it my Denis the Menace top (I know he wore red & black but it just reminds me of him!) & whilst pretty simple & plain in it's design the added long sleeves so you can ruche them at the wrist is a really nice addition. Back to today & it's all about the simple Sunday style - I don't think you can ever go wrong with a light grey marl tee teamed with some light distressed denim & what I particularly love about the one I'm wearing today is that extra detailing with the sequin heart, which just helps elevate the look, especially when teamed with my glitter ballet pumps. The tee was a really lucky sales find back in the depths of last winter. Just my size left & only one in stock meant it was heavily reduced & too hard to resist! So ladies any new purchases you'd care to share? Have you been busy buying bits for your summer holidays or like me concentrating on pieces you can wear time & time again? I'd love to hear what's got you 'clicking that button'. In the meantime have a lovely Sunday & I'll see you in the morning.